Our species can still get schooled on the food chain. Christopher Ketcham is a contributor to Writers on the Range, the opinion service of High Country News. He writes frequently about the West. In the next few weeks, as the bears wake up into the lengthening days of spring, I’ll head into grizzly country to write about the life and death of the animals. A while back, much was written about the killing of a grizzly sow in Yellowstone National Park after she made an unfortunate decision: She mauled a man named Lance Crosby to death for coming too close to her two cubs. The sow, nicknamed Blaze, then fed on poor Lance, and apparently was joined by her family. Then, satiated, she cached the cadaver in forest litter for a later snack. What was not discussed in the news stories was the bears’ need to eat. While we may lament the loss of the individual Lance (about whom I know nothing), we cannot lament when a hungry grizzly enjoys extra meat. Meat is meat, Homo sapiens or otherwise, and in the Northern Rocky Mountains, the grizzlies offer a lesson for the majority of mankind who have forgotten this fact. Thank God for places on earth where our species can still get schooled in the food chain. The Greater Yellowstone Ecosystem, where the suite of aboriginal North American predators is still intact, returns us to the natural system of nourishment: The one who eats shall also be eaten. The early worm gets the bird in the end. Arrogant recreationists, accustomed to roaming the aisles at the supermarket in search of easy prey, learn their biological context in wild country like this. That’s what matters. I was down in the Everglades recently and saw a sign that said, “Fish at your own risk.” This was beautiful, but also shocking, because the National Park Service didn’t mince words. They had surrendered the landscape to the alligators. We think of fishing as the lackadaisical work of Huck Finn along the riverbank, a lazy, loafing, half-asleep activity ideal for a summer swelter. Then, bang, an alligator surges up from the murky waters of the mangroves and swallows whole the innocent American. A jogger on her usual route across the swamp trails of Florida stops to dangle her toes in the water. And all that’s left is the swish of a Nike shoe. Praise the jaws of the wild for teaching us a few things: Don’t be stupid, don’t think you’re the top of things. Be humble, be small, realize that you’re just a morsel in the eternal swirl of heaping recycling death and flesh and life, reborn in the intestines of this or that. In this case, a cold-eyed reptile who probably doesn’t like the taste of Chinese-manufactured shoes. For the sake of the grizzlies, we should place a sign on the stone arch entrance to Yellowstone reminiscent of that found in the necropolis of the Catacombs of Paris: “Stop, you are entering the empire of death.” Henceforth it is park policy that anyone killed by animals should be honored as food: Jim Moaneysworth, of Bankersville, Connecticut, was eaten here by a grizzly, and his cadaver was subsequently fed on by wolves, coyotes, ravens and assorted native worms, and his flesh will be assimilated into the soil, ultimately to invigorate the producer plants of the biome. We thank him, and we invite any visitor to help out the park’s wildlife by following his example. Signed, Dan Wenk, Superintendent, Yellowstone National Park. Generally, the subspecies Homo Americanus is afraid of the wild. He is concerned about the effects it might have on his health. Walking in the backcountry, for example, has long been shown to cause a debilitating freedom of thought. Studies reveal that fresh air damages our ability to sit for long periods in front of a screen. But the most terrifying specter facing Homo Americanus is the prospect of property damage. Send out one bear with a penchant for eating automobiles, and we could see a spectacular drop in visitation to Yellowstone, leading to a net benefit to bears, the park’s other wild things, and the vast complexity of its ecosystem. We might even see the establishment of a foot-traffic-only policy in the park, given the severity of the risk from car-eating grizzlies. 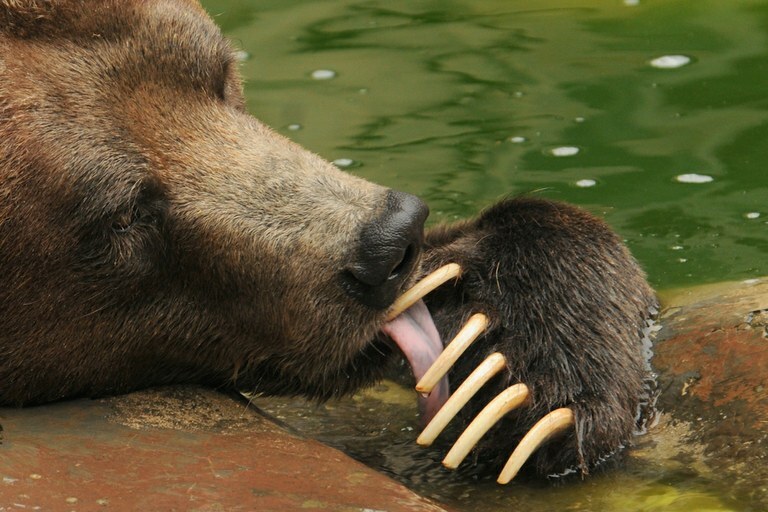 Let us hope that grizzlies get a taste for nibbling on property. It might help save them.